Prepare for your next chessgame Like a Boss would do it. Simple and efficient. Click the button to start. Include some interesting demodata at startup. 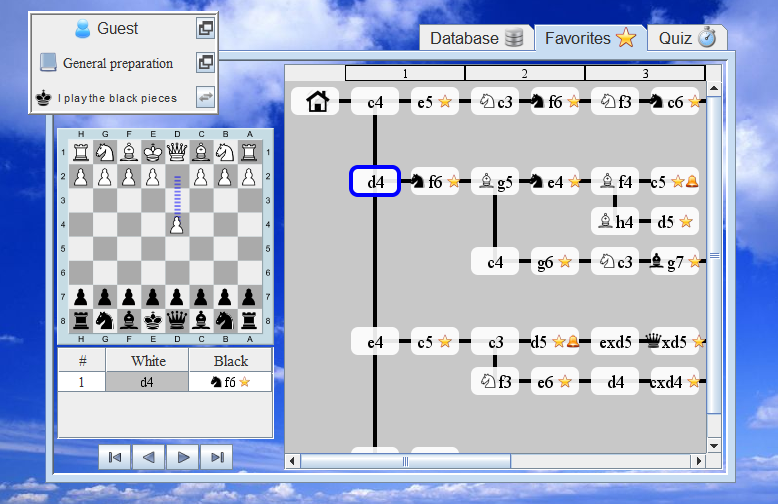 A variation tree can be simple like this or complex with many thousands favorite-moves. Another purpose of this tool is to make you remember the favorite moves. You select a treenode and quiz yourself for this and its successor-treenodes. A 5 minutes repetition of your preparation before a chessgame or tournament could be a good investment. A third purpose of this tool is to save your preparation online and let you access it from anywhere via an internet browser. Your preparation is a living thing so it should be easily edited based on your playing experience and opening studies. Remember your chosen favorite opening moves by taking the Quiz. You are asked for the favorite moves, one at a time. The "difficult" moves can be marked by a bell. These moves can be practiced in a separate quiz. Create more preparations pr user. One preparation could be a general one, where you dont know your opponent. Another could be opponent-specific where you know some of the variants that might be played. Nice resizing graphics that will scale to your screen resolution. Prepare your opening against a specific opponent long time in advance. Then just before the game you refresh your stuff by taking the quiz. 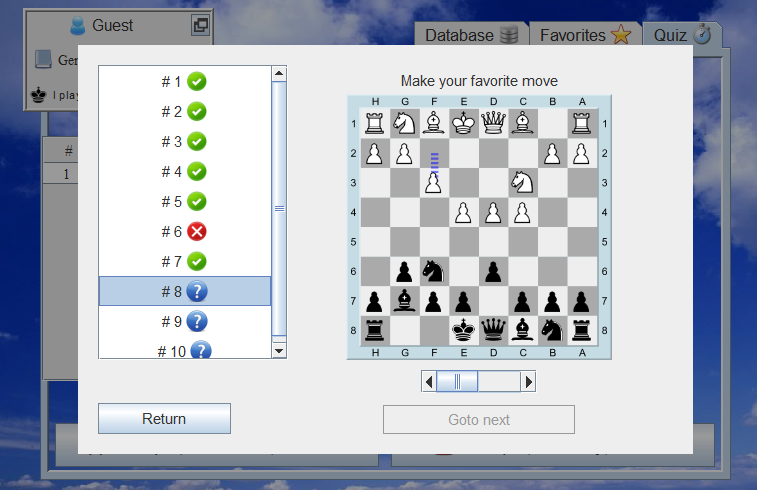 In general its a good idea before a chessgame to use 10 minutes to run through a quiz of your general preparation.